The Lincoln District Streetscape is the cornerstone of the Lincoln Revitalization Project. Key features of the streetscape include neighborhood entryway, roadway, sidewalk and pedestrian infrastructure improvements. 95% of the work is expected to be complete in November. These upgrades have happened along the stretch of South 38th Street, from South J Street to South Fawcett Avenue, which serves as the primary corridor of the Lincoln Business District and Mixed Use Center. This project has worked to enhance pedestrian access, traffic calming measures and landscaping elements. There is also a public art component to provide distinctive gateway attractions on both sides of the improved streetscape. Phase 1, including work along S. 38th Street from S. J Street to S. Fawcett Avenue, and along S. G Street and S. Yakima Avenue, between S. 37th and S. 38th streets is generally complete. Water, storm and sanitary utilities are upgraded, new paving, sidewalk and striping is installed, and all signals are operational. Lanes will still be closed periodically by crews as needed to complete miscellaneous repairs, final landscaping, artwork installation, and any remaining final construction tasks. Phase 2 includes work along S. Yakima Avenue from S. 38th to S. 39th Streets. This involves construction of a new streetscape (new sidewalks, landscaping, artwork, street lighting, etc. 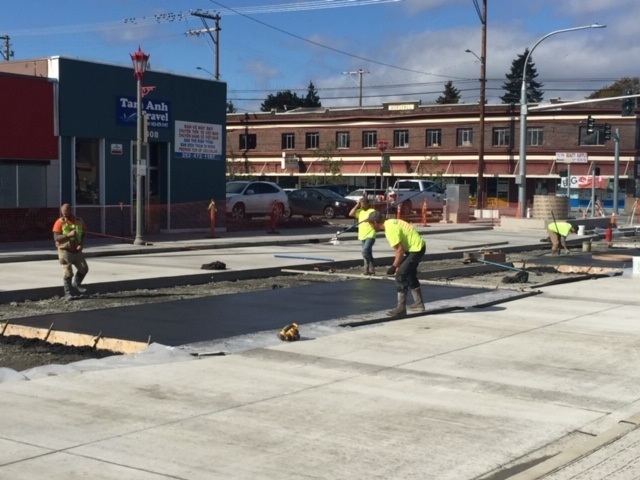 ), similar to what has been constructed along S. 38th St., replacement and upgrading of utilities, removal of asphalt pavement, construction of new colored concrete pavement, and the installation of festival type lighting in the mid-block area. Work started the week of July 23rd and will continue into October. The majority of the improvements will be completed during this time. The contractor, however, is planning to suspend work between October and late December to wait on the arrival of the festival lighting poles. It is anticipated that these poles and the entire festival lighting system will be installed in January 2019. Yakima Avenue between S. 38th and S. 39th Streets will be CLOSED TO TRAFFIC during this phase of the project. Pedestrian access and businesses access will be maintained at all times. Additional customer parking is allowed in the Lincoln High School parking lot and the Tat Plaza parking lot on S. Park Ave. between S. 37th and S. 38th Streets. Phase 1: Consists of South 38th Street from South J Street to South Fawcett Avenue, including South G Street and South Yakima Avenue from South 37th to South 38th streets. Phase 2: Consists of South Yakima Avenue from South 38th to South 39th streets. The City is dedicated to reducing the impact of construction on businesses as much as possible. Staff will hold monthly meetings with the project contractor at the Lincoln Project Office (750 South 38th Street, Suite C) where businesses can ask specific questions and have their concerns addressed. Staff will also be sending out construction updates and information via an electronic email system. Click HERE to subscribe to the Lincoln Revitalization Project Newsletter. The Lincoln Project Office will be open from 8 AM to 5 PM Monday through Friday, with staff who can answer any questions businesses might have. There will be decorative Business Open signs throughout the constructing area to make sure customers know your store is open, as well as printed Pocket Guides with useful strategies for surviving construction.